The tasting room at Cascina Saria offers some of the best views across Piedmont and the southern Alps overlooking Coazzolo and Castagnole delle Lanze where some of the estate's vineyards are located. 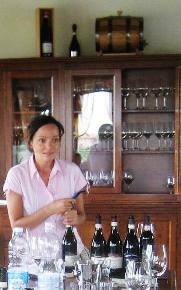 Maura Abbruzzo is in charge of sales whilst her brothers look after the vines and winery, a fairly common set-up. Whilst their parents, Giovanni and Maria, have been farming this land for years, vinification began here as recently as the middle of the last decade. With vines spread between Neive, in the Barbaresco zone, and Costigliole, a renowned area for Barbera d'Asti, it is reasonable to expect high quality wines here; you won't be disappointed. I was warned to expect some very good Barbera but I was surprised just how good it is. The "Convento" is probably one of the most fruit-driven wines I have encountered from the region whilst the more serious "San Lorenzo" is oak-aged although this is for textural reasons: little flavour is imparted. I was extremely impressed with these wines. Then came the Nebbiolos: first a Nebbiolo d'Alba which is almost worryingly inexpensive (I hope Maura doesn't read this!) as it could easily pass for a Barbaresco at twice the price, not something that can be said for most Nebbiolo d'Alba wines! Finally, we tasted several vintages the Barbaresco wines which are more structured and longer-lasting with that elusive, ethereal quality that makes the best wines from this DOCG so irresitible. One final note: not only are these wines delicious but the pricing is quite exceptional. Two high quality Barberas and a delicious Nebbiolo, all under £10 per bottle is seldom seen. Anyone who enjoys these wines should be stock-piling!